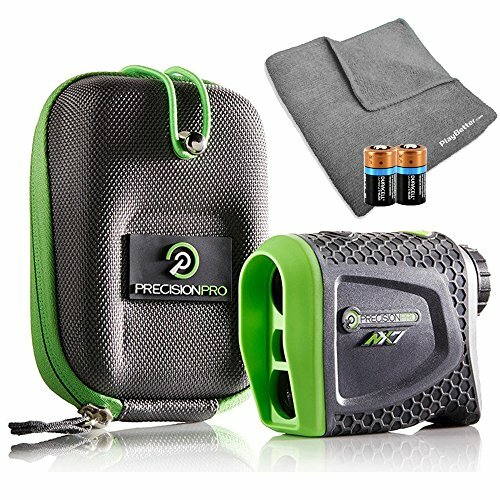 Precision Pro NX7 (Standard Version) Golf Rangefinder Bundle with Carrying Case, Carabiner Clip, PlayBetter Microfiber Towel and Two (2) CR2 Batteries by PlayBetter at iShare Maps. Hurry! Limited time offer. Offer valid only while supplies last. BEST VALUE, HIGHEST-QUALITY RANGEFINDER - featuring TAG technology, Pulse Vibration, 6X Magnification, a water resistant and shock proof design, the NX7 Pro has all the features of more expensive rangefinders for an absolute bargain of a price! TARGET ACQUISITION TECHNOLOGY (TAG) - scans your field of view and locks in on the target to ensure you get the yardage to the target, not what's behind the target.